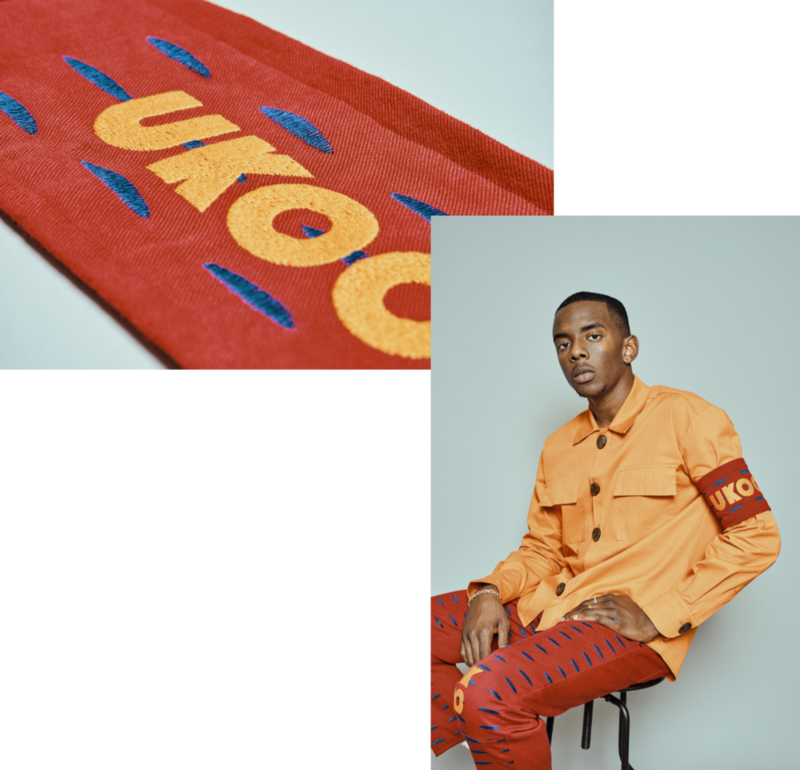 These three questions underscore the intention behind COLLECTION 01 from UKOO STUDIOS — an extensive study of culture and the debut offering of LA-based, Nigerian x Congolese designers, Will Edem and Mike Wamungu. The collection explores themes of consciousness, ancestry, and lineage, manifested into utilitarian silhouettes and vibrant pops of color that embody the pride and resilience of ancestors past; while communicating the dichotomy (and shared synergy) of the African diaspora — particularly between the years of 1957-1969. The look-book finds us immersed in the lush greenery of a vast jungle. A young pair adorned in striking orange and cherry red stand pensively, their gazes demanding a regal deference, yet revealing an intimate, masculine vulnerability. What’s brought them there is unknown. Tribal markings and bare feet hint at a potential pilgrimage. The jungle, all-encompassing and pristine, distorts our perception of time and space. COLLECTION 01 invites us to explore self, unearth what was, question what is, and reimagine what could be. THREE ITEMS. ONE SUIT. HAND-CRAFTED IN LA. AVAILABLE FOR PRE-ORDER NOW THROUGH 1/31/19 ONLY. ITEMS BEGIN SHIPPING IN MARCH. Rich cherry red slim leg jean adorned with tribal markings inviting a traversive life stage. Manufactured with denim fabric made to withstand migration. Finished with a boastful UKOO brand on the knee, an allusion one’s familial allegiance. Rich cherry-red slim leg jean adorned with tribal markings indicate a traversive life stage. Manufactured with denim fabric made to withstand migration. Finished with a boastful UKOO brand on the knee, an allusion to one’s familial allegiance. What is life but a series of conversations and moments, stringed together? COLLECTION 01 is our invitation for you to join this conversation. It is a love letter to change-makers everywhere. To those who’ve decided to buck the status quo, and undertake pursuits that celebrate and instigate the human condition through their work. To don an UKOO garment is to accept one’s responsibility as a provocateur: caretaker of history, community, and culture. And it is to tell one’s story boldly and proudly.